There is a war in Afghanistan for more than 20 years already. It has been started in late 70s when first Soviet troops entered Afghanistan to support the current regime. Then after the collapse of USSR the war with external enemy has stopped for a while, but inside there were still conflicting groups fighting with each other for the power. Little by little Taliban got the dominating position in the country and just a few years later NATO troops entered the country. So all the time there was a war, and most of the time all the parties used Soviet, then Russian weapons. It’s scary to see how the war thematics have moved to all spheres of life in Afghanistan even to carpet weaving skills. Previously this Middle-East country, lying on the border with Russia was famous for its hand-made carpets with beautiful Eastern ornaments. These days weavers make carpets with war. And main war items depicted on the carpets are from Russian origin. 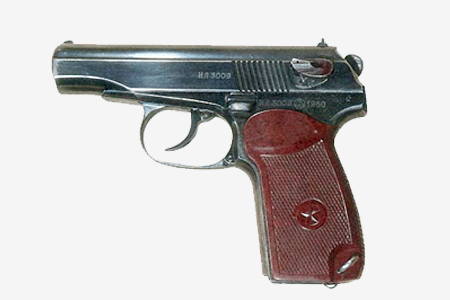 It’s probably the most known Russian gun – AK-47. 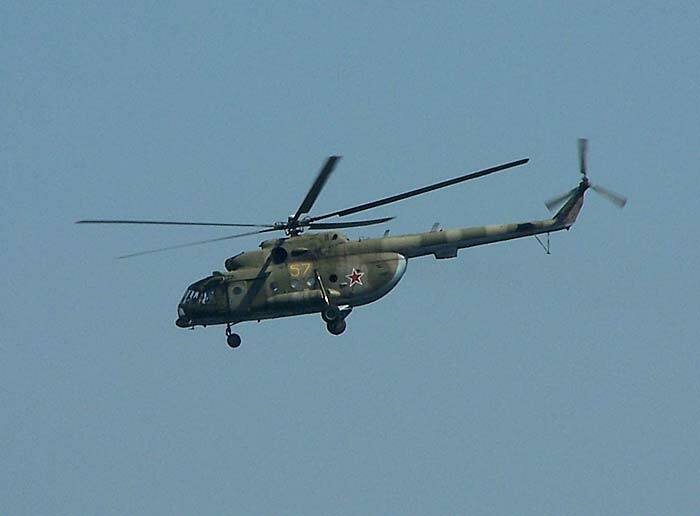 And Russian helicopter MI-8, thousands of them were based in Afghanistan for those 20 years. You can see all of the mentioned above on those carpets. Helicopters even have their numbers. Is that called “realistic art”? 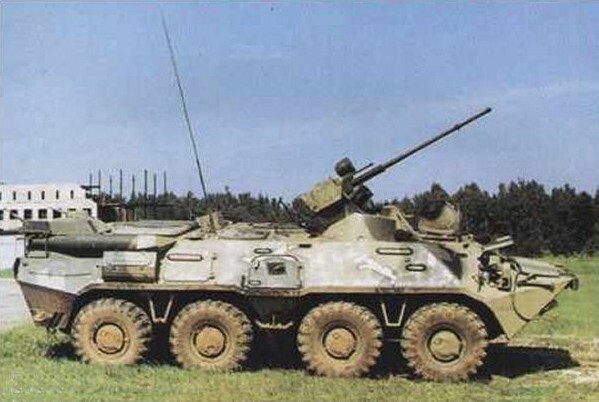 This vehicle is called BTR-80A (http://en.wikipedia.org/wiki/Image:BTR_Versions2.gif. You are a smart cookie, alternating caps man. I’m not sure if English is your native language, or if you are just an American… but his post is pretty much entirely grammatically correct. I’m not an English major, but I can’t see anything wrong with his language offhand. You begin each sentence with a capital letter, as well as any proper nouns, such as American, English, or French would be capitalized. I live in the US, and my girlfriend is an American. I personally, am a Canadian. I don’t have a lot of respect for this country left, due to my being saturated in it for years. No, I didn’t notice that his name had alternating caps. It was the one thing I didn’t look at. Thse carpets are interesting. I am going ot ask my friend if he can buy any next time he is in Afghanistan. You’ve never been outside Russia. It’s likely that you’ve never been outside of your own village. Please find me some Americans that refer to the English language as American. Don’t pretend that you don’t understand that an American who speaks of American language or American English is simply refering to the difference in terminology used in certain contexts by people who were educated in different parts of the world. If you really do not understand that, maybe it would be better to simply not ridicule something that you do not understand. Eh? Most of what the United States today enjoys is because of the immigrants that choose to come and live there. Let me explain some history to you. 200 years ago, the world was a tough place and was still evolving. America was sparsely populated, much behind Western Europe in industrialization and in need of manpower, since slavery was not getting them the skilled technicians. The one thing America had, was a free government unlike a monarch rule in most of the other worlds. They capitalized on this and brought in the smartest people from the world giving them a free hand to do all the research they wanted. There were many smart Americans as well. They had to be ingenious to survive the’wild’ West. But don’t let your ego soak your redneck head. The reason why your economy grows is because of this constant infulx of intelligent ‘foreigners’. But flash forward two hundred years later… and the world is a much nicer place to live in. A significant portion of potential immigrants are no longer choosing to come to the US for opportunities. If you just open your eyes and read about the progress in China and India which together constitute ~half the world population you’ll see who is living off who’s talent. You’re a hoot and a hollar, dextroz. I think America is realizing this is NOT so. Never has this been more evident than today. The current economy in major sectors is reaching a state of capitalistic monopolies. Prices are at record highs while innovation is at the lowest. Since the end of the cold war, any drive to succeed (lateral innovation) has dramatically dwindled. There have been no groundbreaking developments through focussed acheivements as was the case in the earlier half of the twentieth century with the incredible construction, electrical engineering, computation, basic math and sciences not to mention infrastructure. I do agree with your point about the US being the easiest place to start and run a business, but China and India are fast catching up with the pro-entrepreneurship model. This is an advantage of policies which is quite easily replicated. Ed: Don’t forget Property Rights. Not having your land, home, and any other capital and property siezed or threatened by the government or whacky revolutionaries is important to long term social and economic stability. 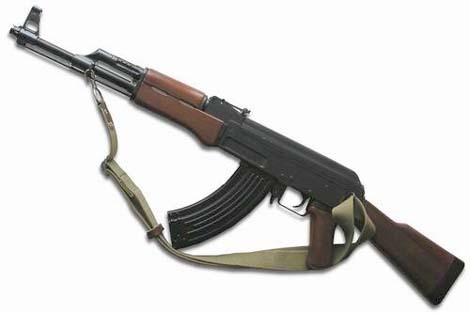 Actually, the beauty of the AK-47 was that it got stuck all the time in dirt and water, but it was made of durable parts and could be serviced in a jiffy by anyone to get it work again. I have to correct a bit of Afghanistan history here. First of all, the war started before the U.S.S.R. invaded. They invaded precisely because the communist government was losing a civil war to an insurgency. And in fact they were invited by the (undemocratic, rather unpopular in the countryside) government. This is overlooked by the American propaganda machine but it’s true. This post also overlooks the serious investment that the C.I.A. made in Afghanistan, mainly supporting Hekmatyar who would later go on to support the Taliban. Thanks to the United States, ground-to-air anti-aircraft missiles proved to be a key component of demoralizing Soviet troops and eventually driving them out. 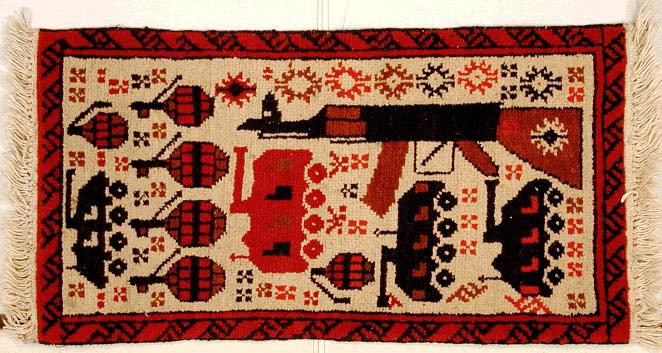 Some carpets with the anti-aircraft missiles also exist. Regarding the America-vs-the-world debate… I refer you to the wisdom of Solomon: the race is not to the swift, nor the battle to the strong… but time and chance happen to them all. That’s all because of Americans. They have attacked peaceful nation of Afghanians and killed all people in Afghanistan. These types of carpets were readily available – rather inexpensively – in the early and middle 1990s in the United States. Any carpet store with a big inventory had at least a handful of them. I was very interested in them at the time, but didn’t have my own home to keep them in, so I passed them up. I kick myself now. 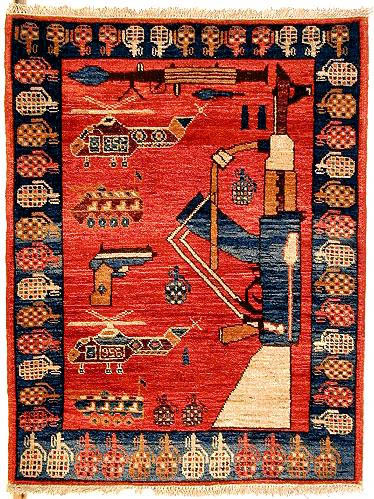 Carpets with helicopters and AK-47s were fascinating and cool. I would guess that they are worth far more now than they were back in 1995, etc. Here are some more challenging ordinance to identify. This rug’s design origin comes from a land mine awareness poster. This one shows F-16s but was woven before the US/British/Coalition operations in Afghanistan. here is a word that might come to mind next artical you post… RESEARCH! OMG I just found this…I own one of these afghan war rugs although mine is a bit more subtle. Mine is large and has tanks around the perimeter. I know a ton of guys who went to Afghanistan and got these rugs. Strangely, I have seen that exact rug design before. I wonder if the Afghans mass produce them or if they outsource.